INDUSTRY.co.id - Jakarta - Continue to increase sales of motor sport in the country underlies the agent holders of KTM brand in Indonesia PT Penta Jaya Laju Motor to continue to expand sales network and after-sales service in the country. This time, KTM opened its new dealership in Semarang, Central Java. This dealer is the 16th in Indonesia after previously been present in several cities in the country. 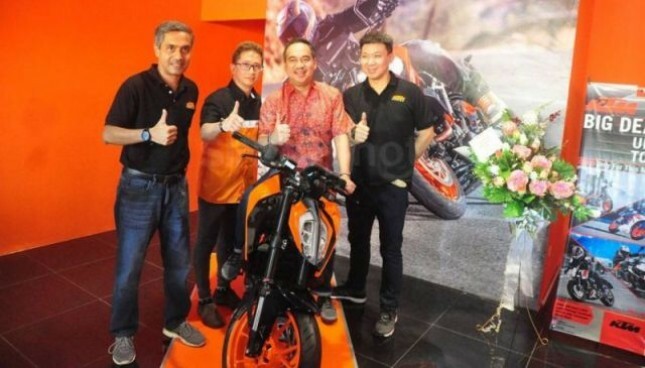 "Currently, it is the 16th dealer in Semarang, following 15 authorized dealers already in various cities," said President Director of PT Penta Jaya Laju Motor, Kristianto Gumadi on the sidelines of the opening of KTM dealership in Semarang. In addition to Semarang, it has prepared at least 7 more dealers ready to operate in early 2018 to expand the market segment, namely KTM Denpasar, Bogor, Lampung, Solo, Yogyakarta, Sidoarjo, and Medan. It targets until the end of 2018 already has 60 dealers spread across several cities in Indonesia. "For Semarang, we are targeting at least 50 units of KTM motorcycles of various types to be sold after the ceremony is inaugurated. The sport bike market is now the most preferred now," he said. Motorcycle manufacturers, he acknowledged, continue to race to create creative and innovative products so that consumers more pampered with the release of a variety of new products, especially motor sport. Motor sport market in Indonesia, he said, for the last 7 years continue to increase, not only from the side of the volume, but also the development of models and technology increasingly rapidly. "In general, there are three factors that influence consumer choice, namely design, price, and brand." Now KTM has these three advantages so we are optimistic about the market, "he said. Moreover, he said, KTM which has been tested as a brand and model so that will be favored by consumers, coupled with sales services and workshops that have been fused. "We have prepared the spare parts, so consumers do not have to worry. All showrooms follow CI KTM standard with 3 S facility (sales, spare parts, and service)," he said. He mentioned there are various types offered, such as KTM Dukes (naked streetfighters) with a capacity of 200 cc, 250 cc, and 390 cc, then KTM RC (supersport racers) 200 cc, 250 cc and 390 cc, "he said. Regarding the price, he said, varies, starting KTM Duke for Rp36, 8 million (200 cc) to Rp101, 3 million (390 cc), and KTM RC from Rp41, 9 million (200 cc) to Rp106, 3 cc (390 cc ). To increase sales, Kristianto said that his side has prepared several steps, including making "event" cooperating with various communities, especially holding "touring" activities. "We are optimistic that we can reach` marketshare` about 10 percent of the motorsport market in Indonesia, especially with the presence of dealers in various regions, "he said.